While evidence show that martial arts have roots in prehistory, the earliest evidence of systematic training in specific martial arts traditions emerges in antiquity (late 1st millennium BC) in both Asia and Europe. The foundation of modern Asian martial arts is likely a blend of early Chinese and Indian martial arts. During the Warring States period of Chinese history (480-221 BC) extensive development in martial philosophy and strategy emerged, as described by Sun Tzu in The Art of War (c. 350 BC). Legendary accounts link the origin of Shaolinquan to the spread of Buddhismfrom India during the early 5th century AD, with the figure of Bodhidharma, to China. 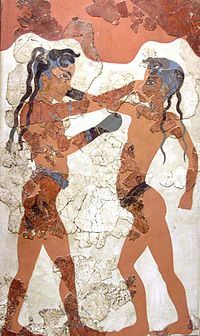 Boxing was practiced in the ancientMediterranean. In Europe, the earliest sources of martial arts traditions date to Classical Antiquity. Boxing (pygme, pyx), Wrestling (pale) and Pankration were represented in the Ancient Olympic Games. The Romans produced gladiatorial combat as a public spectacle. During the Middle Ages, the development of the cossacks as self-governing warrior communities in the current region of Ukraine and Southern Russia resulted in an accumulation of fighting skills passed through generations. Due to a wide variety of climate and enemies, these people developed versatile and fast-learning martial habilities, which are considered to be the roots of systema. A number of historical combat manuals have survived from the European Middle Ages. This includes such styles as sword and shield, two-handed swordfighting and other types of melee weapons besides unarmed combat. The most famous of these is Johannes Lichtenauer‘sFechtbuch (Fencing book) of the 14th century, which today forms the basis of the German school of swordsmanship. Likewise, Asian martial arts become well-documented during the medieval period, Japanese martial arts beginning with the establishment of the samurai nobility in the 12th century, Chinese martial arts with Ming era treatises such as Ji Xiao Xin Shu, Indian martial arts in medieval texts such as the Agni Purana and the Malla Purana, and Korean martial arts with Joseon era texts such as Muyejebo (1598). “Historical martial arts” in both Asia and Europe are mostly based on such records of the late medieval to early modern period (15th to 17th centuries; see also Koryū). European swordsmanship was trained for duels until the Napoleonic era, and developed into sport fencing during the 19th century. Modern boxing originates with Jack Broughton‘s rules in the 18th century, and reaches its present form with the Marquess of Queensberry Rules of 1867. Europe’s colonization of Asian countries also brought about a decline in local martial arts, especially with the introduction of firearms. This can clearly be seen in India after the full establishment of British Raj in the 19th century. Similar phenomena occurred in Southeast Asian colonies such as Malaysia, Indonesia, Vietnam and thePhilippines.